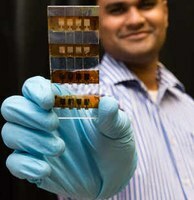 The Focus Research Group (FRG) on Materials for Energy is engaged in the development of Organic Solar Cells and Organic Light Emitting Devices on flexible and stretchable substrates, integration of energy storage devices and batteries with light trapping systems to new generation roofing materials and novel energy generation systems. Both experimental and computational modeling methods have been used to proffer solutions to the Energy needs of the African continent. We have been able to develop the next generation of solar cells and light emitting devices from organic and perovskite-based materials, while also exploring the frontiers of Lithium ion and platinum-based materials for energy storage. Thin films and bulk structures for energy storage.